This lesson provides the student with a general knowledge of holding and its role in departure and arrival procedures. 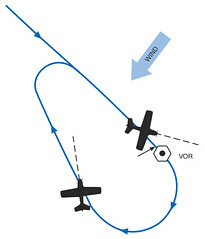 The lesson will be complete when the student can demonstrate an understanding of the techniques for hold entry and holding with minimal instructor guidance. we fly to the fix, then begin the first turn to parallel the inbound. What do we do if we’re off by more than thirty seconds? We know the approximate winds aloft. Try to predict the wind situation. Don’t just fly a normal entry and correct later.